Learn how to play music the easy way with this quick book. A simple and innovative method for everyone and every kind of instrument. Musical notation can virtually describe every bits and pieces of all musical compositions, from their articulations, rhythm, dynamics to repetitions, tempo and so on. To do so, it uses various symbols, called musical symbols or music symbols. On this page, you will find the complete list of musical symbols written in Dodeka alternative music notation, including their names, symbols and meanings. Use the content box to quickly and easily find the meanings of all music symbols. What if learning music theory could be easier, way easier? What if it was? The staff is the main structure of the notation. It is where notes and symbols are placed. The ledger lines are used to notate notes and pitches that go further above or below the staff. Double bar lines separate two section of music. The bold double bar line indicates the end of the composition. Dotted bar lines split complex and long measures into smaller segments to simplify the reading. The bracket connects two or more staves played simultaneously (usually of different musical instruments). In Dodeka chromatic approach, there is no clef on the staff. The pitch range is always the same. Find out more about Dodeka pitch range here. The note duration is indicated through horizontal symbols. The reference value is the crotchet (quarter note), which equals 1 beat, and other notes are defined proportionally. The half note equals two crotchets and is represented proportionally (i.e. 2 crotchets). The crotchet is the reference value and equals 1 beat. The quaver equals half a crotchet and is represented proportionally (i.e. half a crotchet). The semiquaver equals half a quaver and is represented proportionally (i.e. half a quaver). The Demsemiquaver equals half a semiquaver and is represented proportionally (i.e. half a semiquaver). The 1/4 quaver equals a quaver divided by four and is represented proportionally. The 1/4 semiquaver equals a semiquaver divided by four and is represented proportionally. The 1/4 demisemiquaver equals a demisemiquaver divided by four and is represented proportionally. Dotted notes are represented by adding one-half of the note duration. The arrow shape indicated that the note should be played accordingly. A note with a rhythmic value, but no discernible pitch when played. The multi-measure rest indicates resting parts of multiple measures to simplify notation and take less space on the score. The breath mark tells the player to take a slight break. The caesura indicates a brief and silent pause, during which time is not counted. The encircled number represents how many note value appear in each measure, while the bottom note indicates the note value of the basic pulse of music. In this case, the time signature marks that every measure equals three crotchets. The encircled number represents how many subdivisions of the basic pulse in music appear in each measure, while the bottom note indicates the note value of these subdivisions. Usually each beat is composed of three subdivisions. In this case, the time signature marks that every measure equals two dotted crotchets (or six eight notes). This symbol announces that each measure is equals to four crotchets. This symbol announces that each measure is equals to two half-notes beat per mesure. This symbol defines the tempo of the music by assigning absolute durations to all notes. In this example, the metronome mark defines that 120 crotchets makes exactly one minute. The tie indicates that two or more identical notes (same pitch and same length) should be played together as one note of the compound time value. The slur indicates that a series of notes (one or more) should be played without any pause or break. This symbol tells the player to play every in-between notes from the first note indicated to the last one. The tuple indicates a set of notes of irregular time values that should be played within the normal duration of a given number of notes. This example represents three notes played in the normal duration of 1 note. This symbol indicates notes that should be played simultaneously. This symbol indicates a chord in which notes have to be played in rapid succession, while sustained in the progression. Tells the player to engage the sustain pedal. Tells the player to release the sustain pedal. Tells the player to engage the soft pedal. Tells the player to release the soft pedal. Tells the player to engage the sostenuto pedal. Tells the player to release the sostenuto pedal. This symbol indicates the precise use of the sustain pedal. Tells the player to repeat the passage. Tells the player to repeat the last measure or last two measures. The volta bracket indicates a passage that has to be play with different endings on different playing. Tells the player to play the piece from its beginning. Tells the player to play the piece from the nearest sign (segno). Sign or mark used with Da sego symbol. The coda indicates a forward jump in the piece to its ending passage. The trill indicates a rapid alternation between the specified note and the next higher note within the note time value. The upper mordent indicates a rapid alternation between the principal note, the next higher note then the principal note again for the remaining duration. The upper mordent indicates a rapid alternation between the principal note, the below note then the principal note again for the remaining duration. a. Tells the player to play the following pattern: upper auxiliary note, principal note, lower auxiliary note, and return to the principal note. b. Tells the player to play the following pattern: principal note, upper auxiliary note, lower auxiliary note, and return to principal note. c. Tells the player to play the following pattern: principal note, lower auxiliary note, upper auxiliary note and return to principal note. The first half of the principal note's duration has the pitch of the grace note (the first two-thirds if the principal note is a dotted note). The acciaccatura is of very brief duration, as though brushed on the way to the principal note, which receives virtually all of its notated duration. The staccato indicates the player to play the note shorter (usually by half) than notated. The staccato indicates the player to play the note shorter than notated with a longer silence. It is usually applied to short notes, such as quater notes. The accent indicates the player to play the note louder. The tenuto symbol indicates the player to play the note at its full value. The marcato indicates the player to play the note louder than a note with a regular accent. This symbol tells the player to literally mute the note played. For stringed instruments, this symbol tells the player to make the string snap against the frame of his instrument by stretching it away. For stringed instruments, this symbol tells the player to play a natural harmonic. The pause indicates a note or chord that is sustained more than its usual value. On bowed string instrument, the up bow means to play the note with the bow upward. Opposite of the up bow, this symbol indicates to play the note with the bow downward. Want sheet music written in Dodeka alternative music notation? We are working on it! We started the development of the Dodeka Music Library, which seeks to translate as many sheet music as possible into the Dodeka notation. 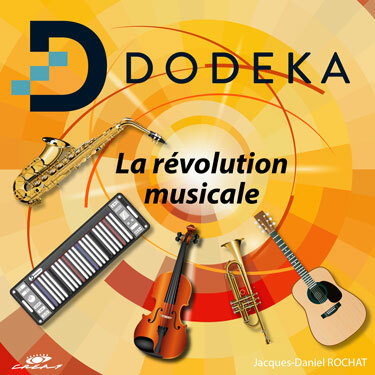 Check out our progress and get early access to the first Dodeka music library. Check Our Music Library Out!